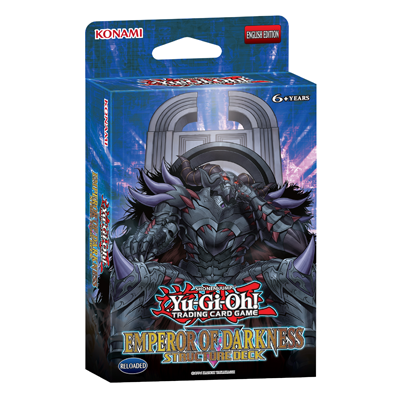 The Emperor of Darkness Structure Deck is filled with some of the most imposing Monsters ever made, and they demand Tribute! Monarchs are high-Level monsters that unleash their devastating elemental powers when Tributes are offered to Summon them. Strike a combo using the mighty Erebus the Underworld Monarch with new support cards like Eidos the Underworld Squire or The Prime Monarch, to thwart your opponent’s strategy and reinforce your Deck! In addition to this 41-card Deck, Duelists can add a brand-new Token card to their collection. With a mix of new and classic cards, this popular theme appeals to both beginning and existing players. Card names and set configuration may change.